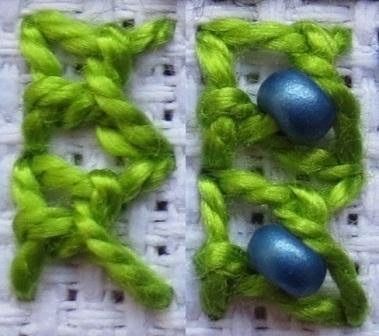 TAST stitch 99 is Eastern stitch and TAST stitch 100 is beaded Eastern stitch. TAST stands for Take A Stitch Tuesday, an embroidery challenge at Pin Tangle. I stitched 2 samplers side by side on 14 count Aida, both with the same threads. This one is done in perle 12 with 2,5 mm beads. The next one is done in perle 8 with 2 mm beads. This one is done in perle 5 with 2,6 mm beads, I made the stitches a bit bigger. My last design is done in Stef Francis perle 5. 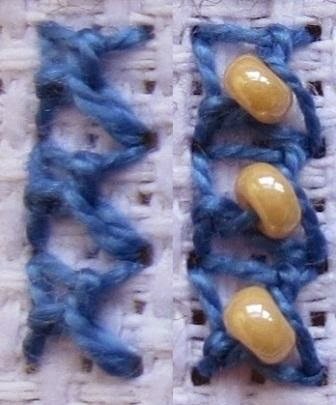 It’s a combo of 4 detached chain stitches as the foundation for the second part of the Eastern stitch. The finished design. I used 2,6 mm beads. Take a closer look at my complete samplers here. Great square with beads! Very ethnic looking. Reminds me of ceramic tiles and mosaics. Mooie steken en die kraaltjes geven het zoveel extra! Congratulations on stitching 100 stitches Annet. 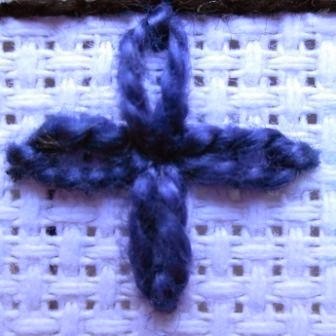 Very few people have done the whole lot and it is not easy to stitch every one. Thanks also for being such a regular reader of Pintangle too! Wonderful work. 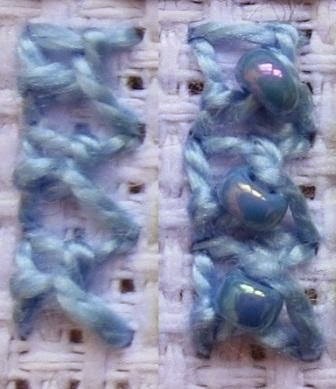 Nice to compare the beaded and un-beaded stitches side by side, but my favourite part of the post is your beautiful combination of Detached Chain and the Eastern Stitch lacing. great samples of these stitches. The comparison is very useful Thanks. great samples of these stitches. the comparison is very useful. I like the version done with detached chain.